Delicious, easy and budget friendly! Ready in less than 30 minutes and serve with a salad, veggies and bread! This is another favorite meal from when I was a child. 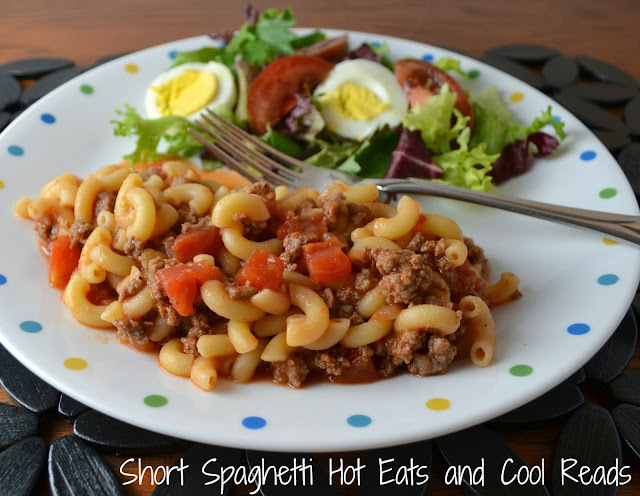 We called it "short spaghetti" but many of you may call it a sort of a "goulash". This is a very simple recipe and it's good to make on a weeknight. I usually have most of these ingredients in the pantry so it's a great go-to recipe for us! Hope you enjoy it was much as we do! If you love pasta, stop over and check out some of my other favorite pasta recipes: Mini Tortellini Kabobs, Cheesy Spinach Rice and Orzo, Spicy Garlic Basil Sesame Noodles, Broccoli and Sweet Pepper Pasta or Ranch Vermicelli Pasta Salad! If you need more recipes to use canned diced tomatoes, check out these: Beefy Tomato Macaroni Soup, Cheesy Beef and Kale Penne Pasta, Slow Cooker Creamy Chicken Tacos, Slow Cooker Tortellini Chili or Baked Ziti! Meanwhile, brown ground beef, onion, garlic, salt and pepper until ground beef is cooked through. Add tomato sauce and diced tomatoes and simmer sauce until noodles are finished. Combine sauce and noodles. Season with more salt and pepper as needed. Top with parmesan cheese and serve with some buttered bread! This recipe looks delicious! I'm so happy that you stopped over and shared at Mix it up Monday :) I hope you'll stop back often and share more of your yummy recipes! Thanks! Glad I found you! I will be back soon!! Are you sure you didn't grow up at my house? We call this Goulash and the recipe is almost the same. It is my husbands favorite. It is a great recipe! Thank you so much for sharing with Full Plate Thursday and have a great week end. Too funny!! This is a favorite in our family! I love it too! Never tried it with tomato soup before! Thanks for stopping by!! I don't know how many time your sister and I made that dish for lunch during the summers in high school! We even made it once for your uncle Norman at your Grandma's house. We shopped at the old Rum River Store for the ingredients :) Memories that make me smile. This is such a perfect cold weather meal. Thank you for linking to the In and Out of the Kitchen Link Party. I look forward to seeing you next week.